"- Why you are studying Japanese? In Thailand, we know a lot about Japanese cultures since there are many cartoons and animes in our childhood. The reason I am studying Japanese is that I want to be able to understand Japanese in cartoons, games and TV programs. I also want to make a lot of Japanese friends! - Why you chose JapanesePod101? I have heard a lot about JapanesePod101 since I started self-studying Japanese. It is recommended by many people because JapanesePod101 has literally tons of useful studying resources and studying tools. There are also price discount campaigns throughout the year which I thought it was worth my investment so I decided to join the Premium Plus membership to gain full access of this learning platform. - What do you like about JapanesePod101? What I like about JapanesePod101 is that there are audio lessons categorized by your Japanese levels. As for me that I have some basic Japanese, I can start right at the beginner level or the low intermediate level instead of absolute beginner level. Another feature that I enjoyed is the personal teacher (available in the Premium Plus membership) which allows you to chat with the native Japanese teachers. Based on your level, you can just type in English to ask your Japanese grammar questions or you can also practice writing in Japanese and let them check your grammar for you! And lastly, the personal teacher regularly sends me Japanese assignments every week and evaluate my skills. It is very helpful. - How you felt about winning the competition? In the past months, there was a competition to win 1 free week of Japanese class in Tokyo at GenkiJACS. I joined the competition and I won! The moment I found out that I won the competition I felt very excited and happy because this was my first time to really study in the language school with the real Japanese teachers! I knew it was going to be the great experience in my life! - How you enjoyed your 1 week with GenkiJACS? Even though it was only 1 week with GenkiJACS, I learned a lot of new grammars and vocabularies. I realized that self-studying was not enough for me because when I was in the language school I had to interact with native speakers which helped improving my listening and speaking skills. All of the staffs and teachers are all kind and helpful. Besides, my classmates from various countries are really nice. It was a short but very fun week. I hope that I will return to study with GenkiJACS again in the future!" Ou-san is from Thailand and has been studying neuroscience at Kyusyu University Graduate School since April. He is an excellent student, so he received scholarships from Thailand to study both at university, and at GenkiJACS. Because I used to watch Doraemon and Ikkyu-san when I was growing up, and it make me interested in the Japanese language. I had lived in Chiba for a month 3 years ago, and often visited Tokyo, but they didn’t agree with me because of how many people there are. On the other hand, Fukuoka is quieter and people in here are kind. Additionally, the food is so good, especially ramen. I recommend trying the ramen shops in Canal City’s Ramen Stadium. I inquired at a lot of Japanese language school about whether they had classes that would satisfy the requirements of my scholarship from Thailand, but didn’t receive any replies. However, Ms. Kei (GenkiJACS staff) immediately responded to my requests and even went so far as to adjust the schedule five times for me. That’s the reason why I chose GenkiJACS. Support from the school staff and teachers was great. My favorite lessons were the additional conversation classes. because you get to practice a lot of Japanese conversation. After two weeks of taking those lessons, I was able to talk to [shop attendants] in Japanese while shopping at a department store. I took some culture classes such as art of wielding swords, Zen meditation, tea ceremony, and they were all very professional and enjoyable. However, I felt like there could have been more explanation about the history of Hakata ningyo in that particular class. If you want to become a Japanese speaker, I recommend studying at GenkiJACS! Now you, too, can become a travel agent at GenkiJACS! Last week, some of our Japanese language students at our Fukuoka school had a lesson in which they became Japanese travel agents. Paired into groups of 2, students tooks turns planning and arranging a trip according to the other student's requests. It was interesting to see the different kinds of trips students wanted to go on. For example, some of our younger students who are still in university or just graduated added lots of time to party and wanted info on popular clubs and bars, while our working-age students generally kept a strict budget in mind, and were more focused on sight-seeing and travel. One of the things that sets our Japanese language school apart from others is that we teach students how to apply what they've learned in class, outside school in real-world situations. Yesterday, we followed some of our students from Fukuoka school on one of their conversational class outlessons. Students had learned how to ask for directions in Japanese in class, and were set loose on the streets of Tenjin to test their knowledge! The first part of the challenge was asking for directions. And the next part was listening to the actual directions given, and seeing if they could understand what to do, and where to go! After asking the route, students then drew it out on a map of Tenjin, before comparing notes to see if they all understood the directions clearly. Big success! All of our students got where they were supposed to go, without getting lost! We recently received a HUGE box filled with sweets, cookies and chocolates all the way from Germany, from one of our frequent Japanese language students, Dieter-san. Thank you so much for the amazing and generous gift, Dieter-san! The teachers and staff were soooo happy to get so many yummy treats! We'll have to take special care to keep them hidden, otherwise they'll never last the week!! We recently had our first ever returning student at the Tokyo branch of Genki Japanese Language and Culture school! Mattias Aunes-san came back to study with us after just two months! Mattias-san was one of our first students at Tokyo. Thanks for supporting us, Mattias-san! We hope you enjoy studying with us as much as we enjoy having you! 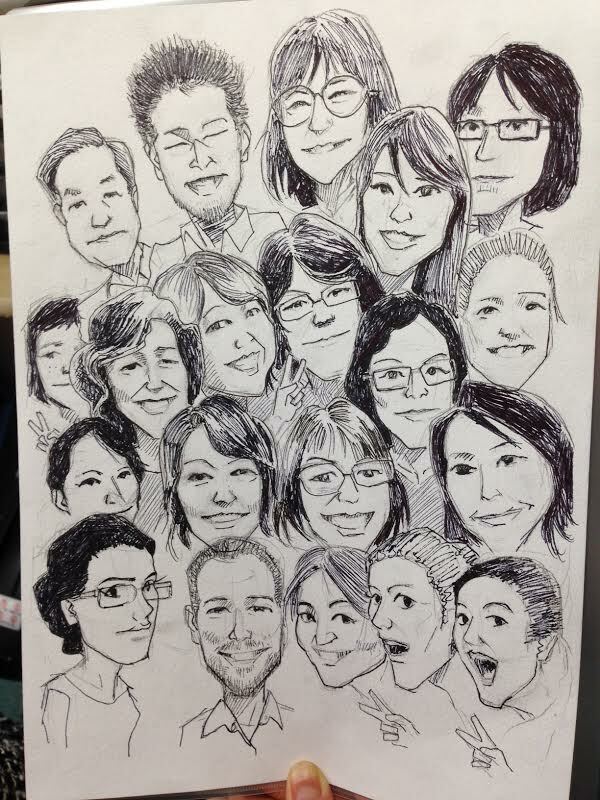 We have so many students coming back to Genki to study with us. Some even come as many as multiple times per year! We'd like to take this opportunity to thank all our returning students for their ongoing support. You guys rock!